OK! You’ve made your red sauce and you’ve made your white sauce; your cheese is well and truly grated, your chicken cubed and good to go. 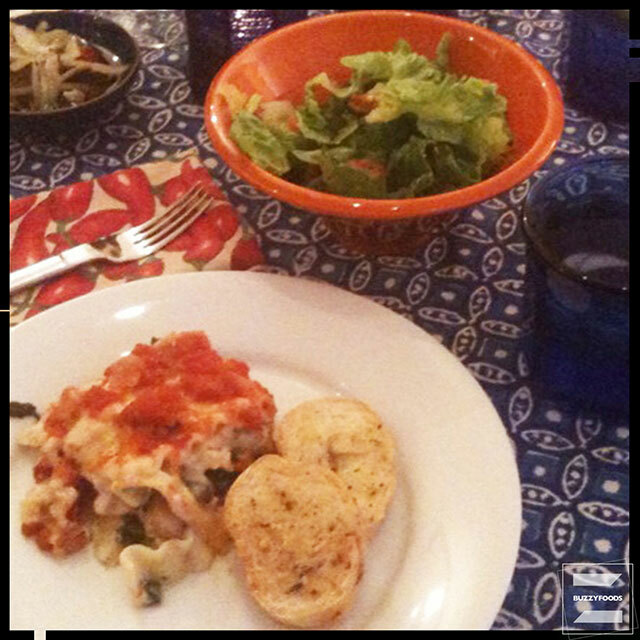 You’ve chosen your vegetables, opted for and against ‘shrooms; and cooked and drained 10 to 12 curly lasagna noodles. Let’s recap our check list, shall we? Line bottom of oiled baking dish with a layer of lasagna. 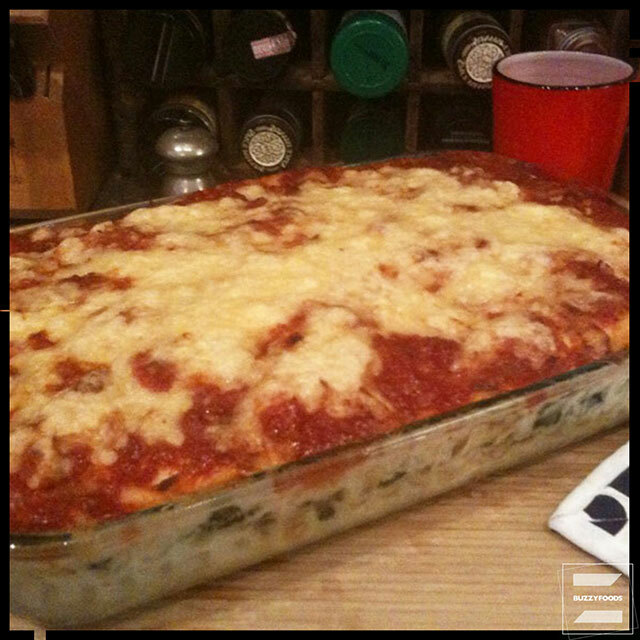 Being sure to reserve 1 cup for top of lasagna later, spread 2 to 3 spoonfuls of white-wine onion sauce over the lasagna. Spread on half the green vegetables, sprinkle on the grated cheese, half the diced meat, and half the optional mushrooms. Spread over this a some white sauce. Cover with another layer of lasagna, and spread over it the rest of the green vegetables, more cheese, the remaining meat and optional mushrooms, then one last layer of lasagna. Trim off protruding edges of lasagna, and tuck it all down into the edges of the dish. Mask top of lasagna with more white sauce, covering as much as you can. Spoon the tomato sauce unevenly over the surface, leaving no lasagna exposed. Sprinkle grated cheese over all, using 1/3 to 1⁄2 cup. If not baked immediately, cover and refrigerate. Bake in upper third of a pre-heated 400º oven for about 30 minutes (40 if chilled), until dish is bubbling hot and top of cheese has browned nicely. Save yourself some clean up and put your pan on a foil-lined, rimmed baking pan to catch any drips and drizzles. Remove from oven and allow to rest for fifteen minutes before serving. This entry was posted in Chicken/Turkey/Duck, Pasta and tagged Chicken/Turkey/Duck, Lasagna, Pasta. Bookmark the permalink.